Can you believe the start of the season is just around the corner?!! 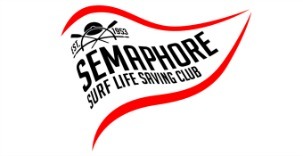 If you are keen to join the Semaphore SLSC or are ready to renew your membership there are a couple of ways you can do that. You can join or renew online straight away. But if you prefer the face to face experience we will be having our annual Membership Registration Day on Sunday 23rd September between 2 and 5pm. Calling all Nipper families – We can finally move the Junior Equipment back in to the Clubrooms and require assistance for a couple of hours to do so. When: Sunday 16th September at 12pm. Text Steph Breden on 0429 046 362 if you can help out. The more people we have the quicker it will be!!! Thank you to our new volunteers – Gregg Newman, David Sands and Cassie Lindsay offering to help out in Assistant Roles. Training will generally finish at 3pm, but on occasion there will be planned club events after this time like a club swim, iron person or run, with a few fun activities thrown in to the mix. There may be instances where we move training due to conditions (e.g. heat) but this information will be released via SMS prior to the day. We are in the process of setting up a Facebook group specifically for junior parents to increase Information flow. I would like to take this opportunity to thank those who completed our short survey regarding last year’s program. The Junior panel will review the responses soon and act accordingly. One area that was highlighted was surrounding the amount and quality of information. We will be drilling down further in this area soon with a follow up survey. Calling all Nipper families – We can finally move the Junior Equipment back in to the Clubrooms and require assistance for couple of hours to do so. When: Sunday 16th September at 12pm. Text Steph Breden on 0423 046 362 if you can help out. Under 11’s Assistant Manager (Adult) this will be shared with Shane Griffin who cannot commit to every week. 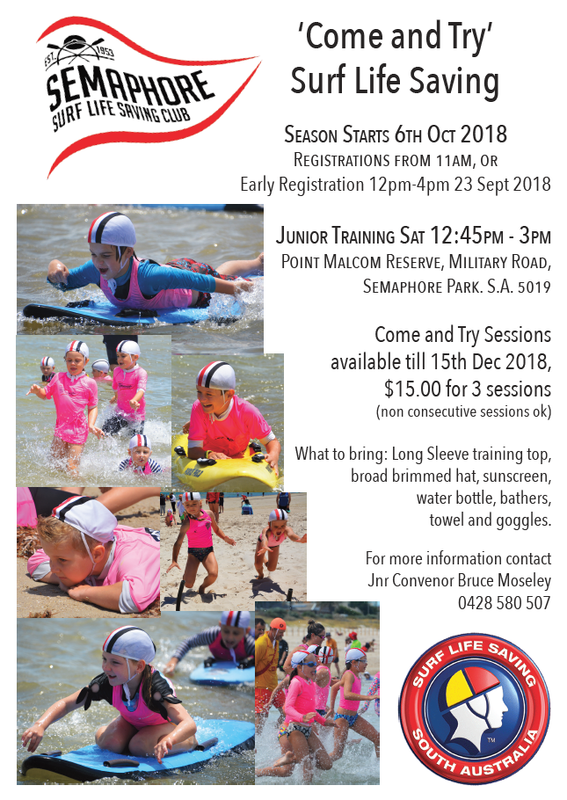 Other (SRC etc) Assistants – *** Any SRC’s or SRC Trainees*** that are interested in helping with an age group please send an E-mail to juniorsec@semaphoreslsc.com.au Please indicate your preference for a particular age group or if you simply wish to assist with water cover etc. BUT IT DOESN’T STOP THERE!!! This year we are impressing on all parents that we want your active involvement in training. No Life Saving experience required. So make sure you wear something you can get wet, and get set to have some fun with our youngsters. We wish to thank Jeff Bampton and Brad Tunbridge for volunteering to do some work in this space. Jeff for Beach and water skills and Brad for some Surf Ed training – D.R.A.B.C.D (CPR etc). I would also like to re invite nominations for this crucial role. If you have any interest in passing on your skills contact us at juniorsec@semaphoreslsc.com.au. Again I stress this is not to be a full-time role. We are happy to work in with you and your availability. We are looking for a coach or coaches for March Past. Kelly and Brooke have announced their retirement from March Past Coaching this year. We wish to thank them for their patience and persistence over the last few years. Our A Team won a Bronze medal at States last season no doubt due to all your had work. Thanks Again, You will be missed. This, however, leaves us with a large hole as far as March Past is concerned. Send your details to juniorsec@semaphoreslsc.com.au if interested in filling this crucial role. 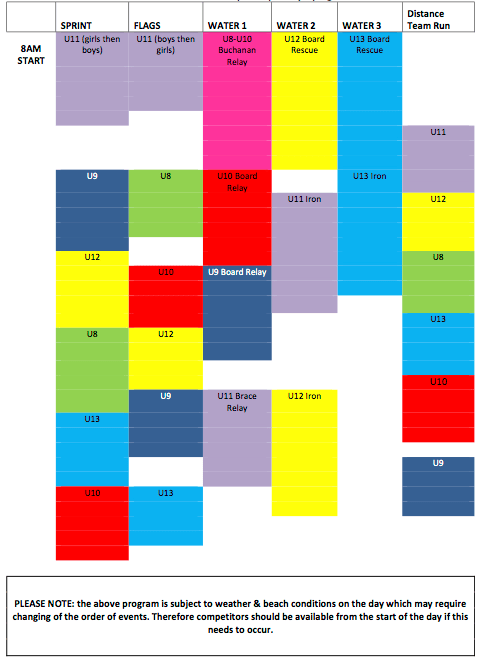 I don’t recall ever not fielding a Junior March Past Team so getting this up and running before the first carnival would be great. A reminder that there will be a Youth Group information BBQ Sunday 23rd September 11am. Come along to hear about the exciting season ahead. Please RSVP to Luke or Georgia on 0431376722 or 0429066138 before the day. Nippers Calendar will be issued again on the weekend. Not sure it gets any better than this, with Board Rescue for U12’s & 13’s going down to Medals, our Under 12’s took out 1st, 2nd and 3rd. Congratulations to Tylor Richards & Amy Buck, Jake Andrews & Hunter Allen (absent from photo), Noah Heffernan & Luc Lindsay. Rumor is that their coach, Jacko Mahney, promised the entire U12 team a Fasta Pasta dinner (HIS TREAT) after States Day 3 (Saturday 10th) if it happened. Nice One Jacko!! Another standout mention was our Buchannon Team of Joel Andrews & Ky Bampton (U8), Sharni Forrest & Max Jarvis (U9), and Ava Griffin & Jack Travers (U10) finishing in overall 9th place. It was a long day for all with the last events not finishing until after 5pm. All our Nippers represented Semaphore SLSC well, and we wish them all luck with next week’s club champs and States Day 2, 3 and 4 the following week. We must give a massive thanks to both water cover and our officials for their usual huge effort without which we could not be on the beach every week. Board Training as usual this Friday 2nd March, 2018, the board trailer will be there so it is open to all proficient Nippers. 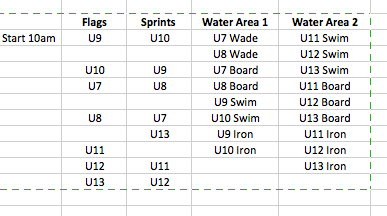 Selection has been made for the Semaphore All Age Relay team competing on the last day at States. A training session has been scheduled to be held directly after Club Championships with Coaches Jacko Mahney and Luke Zille. All R&R Competitors please note there will be R&R training after Club Champs on Saturday 3rd of March from 1pm. I’m sure your all very sick about the banging on over Hi- Vis vests however it’s all about safety in, and around the water so there will be the standard club vests available for purchase in most sizes from now until competition starts on Day 3 of States, see Steph. **Junior Lifesaver of the Year Presentations will not happen on this day as they will be presented at the SLSSA Red and Yellow Ball. More information will become available over the next few weeks so please watch this space. PLEASE NOTE: that shower and change room facilities are no longer available with the renovations to the clubrooms, (thus we have transferred the Shaving Cream Fight to the end of our presentations). Your preparations to join this activity should take this into account. It’s a great chance to hit the pool before Club Championships this weekend and States next weekend. Junior Swimming training will take place at the Largs Swim Centre from 7-8pm Wednesday 28th February. Surf Life Saving SA has notified us of the requirements for Hi-vis Vests for both Qualifying and State Carnivals. Competitors may wear either Pink or Yellow (or the new combination Yellow Front, Pink Back version). However, the Hi-Vis Vest irrespective of colour cannot be faded, and that a competitor with a faded Hi-Vis will not be allowed to compete. Hi Vis Vests will be available for purchase first thing Saturday morning. Please find Steph Breden. OR from the Finz merchandise Tent but I have no info of their opening time (traditionally 9am). The 1 km Team Run, Buchannon, Brace Relay and Board Rescue will be competed down to Medals. That means that the Heats, Semi-finals and Finals will be run for the appropriate Age Groups on this day, with medals presented at the State Championship Carnival 2 weeks later. Please Note that events start at 8am, there will be no RnR or March Past Events, so we are requesting all competitors to be on the beach at 7:30am. Grange is notoriously bad for parking. I have received no further information regarding any arrangements for parking so please allow plenty of time to park and get on the beach.